I’ve always been a big fan of iStat menus, the freeware system monitoring utility. It’s a great way to quickly see what’s going on with my Mac, whether it’s CPU, disk or memory utilization, temperature, etc. Bjango, the iPhone side of iSlayer (producers of iStat menus), has recently released iStat Server, a free Mac application that runs in the background. It sends your Mac’s system monitoring information to your iPhone for actual monitoring. 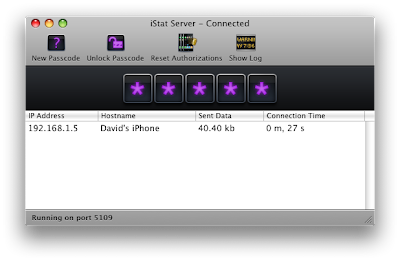 On the iPhone side you buy the $1.99 iStat – System Monitoring application, which then connects with your Mac and displays your monitoring information on your iPhone. If you want to remotely monitor one or more of your Macs for the ridiculously affordable price of $2 then this is a very cool set up. It will display a code that you will need to enter on your iPhone once you connect; mine is currently locked so it displays as asterisks. Or you can connect to any of the Macs you installed iStat Server on. If they are on your local network ISM will detect them automatically. If you are using remote servers you can manually add them, using the IP address and port number they are broadcasting their information on. Viewing a server that’s running iStat Server gives you a great view of the monitors you would normally see with iStat menus, including consolidated CPU utilization, memory, disk usage, networking traffic use and every temperature that you could ever want to see. Rounding out SSM it also includes a Ping and Traceroute utility as well as the ability to free the memory on your iPhone and send your iPhone’s unique identifier or MAC address through e-mail. On the iStat Server side you don’t need to leave the application window open or even keep it hidden; just quit the application and it will continue to broadcast iStat server data until you uninstall it. On my Mac Pro it uses just under 3MB or real memory. If you really want to monitor your Mac’s performance from virtually anywhere (assuming you’ve set up your Firewall / router), iStat Server Monitoring is an excellent way to do it.